Location: 6425 – 120 Avenue, Edmonton. The parish was initially organized as a mission, served by the Basilian Fathers from St. Josaphat Parish from 1940 to 1946, after which, Father Andrew Truch, OSBM, served the mission from 1946 to 1949. The land for the church was bought in 1948. Construction of the church (96’ x 71’) began in 1950 with a hall in the basement and kitchen for Parish events. The church was completed by 1960. In 1985 there were 275 families. The Parish has an active Ukrainian Catholic Women’s League (UCWLC) and Ukrainian Catholic Brotherhood (BUCC). The church has red bricks on the outside, and is painted inside, including the choir balcony. 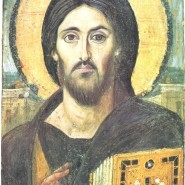 The iconostasis was done some years later. In addition to the church property the parishioners established one of the first Seniors’ homes for our people in 1970 at 7404 – 138 Avenue, Edmonton. Parish priests who served the community: Fr. Michael Sopulak (1950-1956), Fr. Demetrius Greschuk (1956-1959), Fr. Yaroslaw Fedunyk (1959-1989), Fr. Bohdan Snihurowych (1989-1993), Fr. Benny Ambrose (1993-1997), Fr. William Hupalo (1997-1999), Fr. Michael Kowalchyk (1999-2000), Fr. Myron Pyszcz (2000-2003), Fr. William Hupalo (2003-2008), Fr. Roman Dobrianski (2008-2011), Fr. Mihajlo Planchak (2012-). Great and Holy Friday. Our Venerable Father John the Ancient Hermit (c. 800); Matins - John 13:31-18:1; John 18:1-28; Matthew 26:57-75; John 18:28-19:16; Matthew 27:3-32 Mark 15:16-32; Matthew 27:33-54; Luke 23:32-49; John 19:25-37; Mark 15:43-47; John 19:38-42; Matthew 27:62-66; First Hour - Zechariah 11:10-13; Galatians 6:14-18; Matthew 27:1-56; Third Hour - Isaiah 50:4-11; Romans 5:6-11; Mark 15:16-41; Sixth Hour - Isaiah 52:13-54:1; Hebrews 2:11-18; Luke 23:32-49; Ninth Hour - Jeremiah 11:18-23; 12:15,9-11,14,15; Hebrews 10:19-31; John 18:28-19:37; Vespers - Exodus 33:11-23; Job 42:12-16; Isaiah 52:13-54:1; 1 Corinthians 1:18-2:2; Matthew 27:1-38; Luke 23:39-43; Matthew 27:39-54; John 19:31-37; Matthew 27:55-61. Great and Holy Week. Strict Fast. Abstention from meat, dairy and eggs, and foods that contain these ingredients. 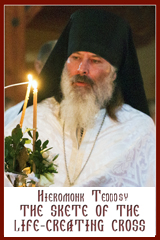 According to liturgical prescriptions, the Divine Liturgy is not celebrated today.